Food prep ahead of time is such an important part of eating healthy, so I mention it often. When you walk in the door after a stressful day, it can make or break your dinner choices knowing that you have something ready to go in the fridge to eat within minutes. It makes packing breakfasts and lunches a breeze as well for the next day. I also post “recipes” from time to time on here with what I do. This is another one of those recipes that isn’t really a recipe per se. It’s more of a grab what you have in the fridge and throw it together thing. The instructions that I give as a basic start to clients when putting meals together is to pick a protein, add some veggies, choose a carb, and throw on a sauce. Microwave if needed and done! Microwave the spinach, rice, and pork until warm. Divide the spinach onto plates, spoon the rice over top, and arrange the pork slices over the rice. Top with the cheese strips, sprinkle on the crushed red pepper, and serve with hot sauce. Makes 4 servings at approximately 352 calories – 32g protein, 35g carbs, and 9g fat. I had a plastic container of spinach from the store that was already washed and ready to go. Just grab and serve. Sometimes I microwave it to steam it a little and sometimes I don’t. You can substitute almost any grain you have in the fridge instead of the rice. Go with white rice, wild rice, quinoa, farro, couscous. You can batch cook all of these and they keep well in the fridge. 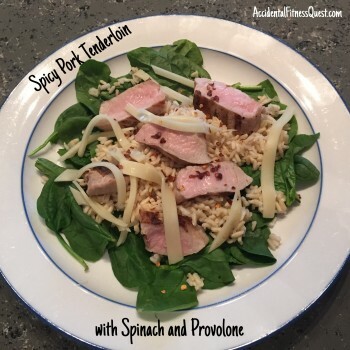 You can use any protein as well if you don’t have pork. Grilled chicken breasts, steak, burgers, salmon. Slice or don’t slice as well. Make it easy on yourself. Pick any cheese or leave it off. I only had cheese slices so I cut them into strips. If you have a bag of shredded cheese, you’re ahead in the game here. If you don’t like spicy, pick a different sauce or dressing. I had harissa leftover in the fridge from my Moroccan Chicken and decided to use that. I’m seriously in love with the stuff. I use it in wraps, on salads, on eggs. I always have a spare on hand so I don’t run out! Be bold and get creative with your combinations and you’ll never get bored. Tastebud boredom is the end of many a diet so I always encourage having fun with your meals while building some healthy eating habits. This is just one of the habits that I work with nutrition clients on building so that they aren’t always on a diet or off a diet. It’s more just the way they eat.